I have been looking into using solely natural ingredients on my face, and after doing some research, I came across the benefits of lemon for acne scarring. 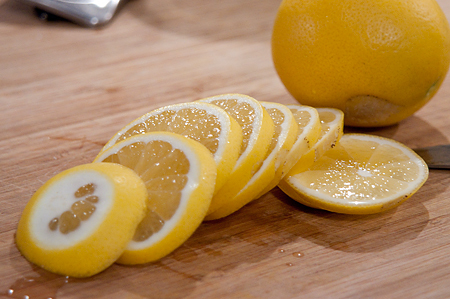 It's really simple: cut the lemon into disks and then take one and apply it topically all over your face or simply on your problem areas and store the remaining slices in a sealed plastic bag in the fridge for future use. It will visibly reduce any redness, and overtime, will help your skin heal from any scarring caused by breakouts. Have you ever tried lemons/limes on your acne? What were your impressions? Sounds like a good thing to try. I will keep that in mind. It does makes sense, I use Vitamin C, asorbic acid and it does the same. Like your blog, come by on mine, maybe we can follow each other? great tip! i have used lemons for break outs from years back! I myself is suffering from acne, I do get it occasionally. They come and go and when they go it leaves a nasty mark. I tried this method and I can see that it helps lighten the pigmentation a bit. Other than that I believe it is effective, for me at least. I don't have acne, but do have a lot of freckles! Would lemon work as well you think? Hi! I found your blog on The Lily White English Rose's bloghop :) I love your blog! I have been using lemon to brighten my skin, but i didn't know it helped with acne scaring. Will have to try this more often. Following your site now :D I love it! hi Natalie! :D I am coming by to let you know I have changed my blog name to better fit what I blog about. ^___^ the new name is aleume.wordpress.com so you can update following links and what not. I haven't tried this yet, but I might. I know I see a lot of people suggesting this. I have never tried it myself, but apparently it can help! :) checking out your giveaway now! Oh really? That's exciting, I'm gonna try it tomorrow ! Yes actually, I did put it on a breakout I had, I had heard it helps get rid of acne and I do think it helped! But I had no idea about redness and scarring, I'll have to try it more often!